Vua, a new Vietnamese sandwich shop, opens its first store in downtown Montreal, equipped with Mirada Media digital signage and menu board systems. 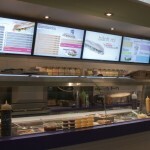 Montreal, Quebec, June 8, 2010 – Mirada Media, a Montreal, Quebec-based digital signage integrator, is pleased to announce the recent installation of a digital menu board and signage system at Vua, a new sandwich shop in downtown Montreal. Vua was fitted with a 5-screen menu board, powered by Mirada Media’s new MenuView software, and two client communication boards. Vua, which literally means “king” in Vietnamese, wants to rule the submarine sandwich market with its value-priced baguettes and novel marketing efforts. “I’m always searching for the best equipment and the newest technological tools to stay ahead of my competition and make a splash with my patrons,” says Mr. Nhu Ngoc Ho, proprietor of the new Vietnamese Bánh Mì sandwich quick-serve. “Mirada Media’s digital menu board is an investment I’m proud of,” he adds. Four of the five LCD menu screens display menu items with an animated area informing the patrons about product category details, specials, and high-margin items, and inciting them to upgrade to a “combo” meal. 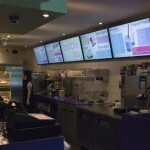 The fifth central screen displays a loop of promotional videos to push Vua’s loyalty program, prepared counter items, like sushi, and refreshing smoothies and bubble teas. 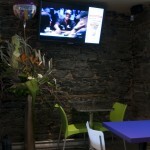 The two client communication boards, installed in the restaurant’s dining areas, are divided screens that combine digital cable programming with digital ads. While patrons view local news programming, the ad zones loop many of the promotional messages found on the menu boards. Vua’s digital signage system is powered by MenuView, Mirada Media’s new Software-as-a-Service (SaaS) offering, that combines standard media and playlist scheduling with item and menu management via an easy to use web interface. 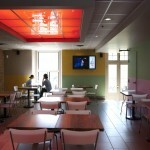 “Restaurants have special digital signage needs,” says Eric Morello, Marketing director at Mirada Media Inc. “Given that requests for digital menu boards are ever-increasing and that we’ve built so many custom modules, it followed naturally for us to package these into a single content management system.” A new MenuView website, http://www.menuview.com, will launch this summer, providing customers with a menu board configuration platform and menu management demos. Always looks good in restaurants and places like that. Looks much more professional.